MODESTO, Calif. - On Saturday night it was the Stockton Ports pitching staff that shined in a one-hit shutout. 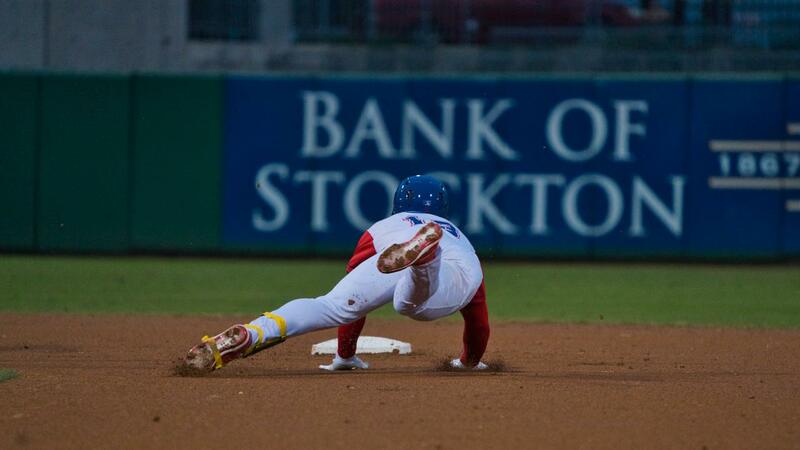 On Sunday afternoon at John Thurman Field, it was Modesto Nuts starter Ljay Newsome (2-1) who sparkled. Newsome retired the first 15 batters he faced and kept the Stockton offense at bay as the Nuts snapped a six-game losing streak with a 5-1 win over the Ports, who see their three-game win streak come to an end. Modesto's offense scored its first run off Ports starter Jared Poche'' (0-2) without the benefit of a hit in the second inning. Poche' issued back-to-back walks to Joe Rizzo and Anthony Jimenez. After a sacrifice bunt advanced both runners, Eugene Helder grounded out to bring in Rizzo and give the Nuts a 1-0 lead. The Nuts extended their lead in the fourth inning with back-to-back two-out hits. Luis Liberato singled, stole second and scored on an ensuing double by Helder to make it 2-0. The double was Modesto's first extra-base hit since Monday. Poche' would suffer the loss, going five innings and allowing two runs on three hits while walking three and striking out one. Newsome, who retired his first 15 batters, gave up his first hit to begin the sixth, a single by Jonah Bride. Jordan Devencenzi followed with a single and Mickey McDonald a bunt single to load the bases with nobody out. Newsome would bear down, striking out Nick Allen, getting Jameson Hannah to ground into a force play at home plate and striking out Austin Beck to escape the jam unscathed. Newsome earned the win in the contest, going 6 2/3 scoreless innings and allowing four hits while striking out 10, one away from matching his career high. Stockton's lone run came in the eighth off Nuts reliever Collin Kober. Devencenzi reached on a bunt single to open the inning and McDonald followed by drawing a walk. Allen came up next and delivered a double to right field to score Devencenzi and make it a 2-1 game. With runners at second and third and nobody out, Kober would strike out Hannah and Beck back-to-back. After intentionally walking Alfonso Rivas to load the bases, Kober got Hunter Hargrove to pop out to first to end the inning and escape further damage. Kober allowed one run on two hits over 1 1/3 innings of relief. Modesto added to its lead in the bottom of the eighth facing Daulton Jefferies, who came on in relief of Poche to begin the sixth. After working two perfect innings, including the seventh in which he struck out the side, Jefferies gave up a leadoff single to Connor Kopach in the eighth followed by a walk to Jack Larsen. With two on and nobody out, Cal Raleigh hit a three-run homer to right to widen the Nuts lead to 5-1. Jefferies completed three innings and allowed three runs on three hits while walking one and striking out five. Collin Kober struck out the side in order in the top of the ninth to finish the game for Modesto. After taking three of four from the Nuts, the Ports continue their road trip on Monday night as they open a three-game series in San Jose. Mitchell Jordan (0-1, 6.00 ERA) gets the nod for Stockton in the series opener, opposed by San Jose southpaw John Gavin (0-0, 1.50 ERA). First pitch is set for 6:30 p.m. PDT.